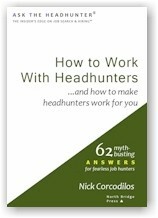 The Headhunter (Nick Corcodilos) makes frequent appearances online, on TV, radio and in person... he's been on CNN and CNBC taking "live" questions from viewers for an hour at a time, and is a popular guest on talk radio around the country. If you haven't caught him yet on your favorite station, call and ask for The Headhunter! Media folks can contact Nick at mail@asktheheadhunter.com. Would your organization or company like to schedule an event with Nick? Learn more here: Nick In Person. None currently scheduled. Please check again! If you have a problem getting information on any events listed above, or if you'd like to suggest a venue, please drop a note to The Headhunter. MBACSWP is a consortium of career center directors from the top 30 MBA and Executive MBA schools worldwide. 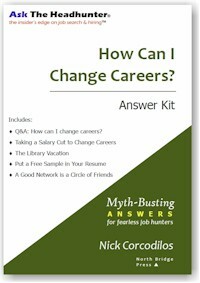 2008 Careers Conference Keynote: Beyond the Obstacles: What your client needs to know to win the job. Joint FENG, MENG, TENG event, Morristown, NJ. CNN with Wolf Blitzer. Archived. The Exchange with Laura Knoy. Archived.